This is my first blog post for 2019 because, so far, it has been an annus horribilis in terms of cycling activity compounded by being hit by a lorry door. I am now in a period of post-concussion syndrome and having to take things easy. My headaches have prevented any consumption of beer for weeks! Today, as a gentle reintroduction to gentle pedalling and drinking was a trip to Coventry. So, we unwrapped our folding bikes for the spring and hopped on the train across the Meriden gap. 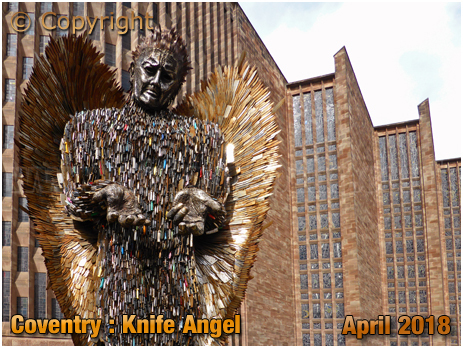 A key reason for choosing to visit Coventry was to see the Knife Angel, a giant 27-foot sculpture exhibited outside the cathedral, as part of its journey around the UK as a National Monument against Violence and Aggression. The sculpture came about as a result of the British Ironwork Centre working with police forces across the country to retrieve knives from the streets of the UK through knife banks. Relatives of those killed because of knife crime were invited to engrave the confiscated blades with names and messages for their loved ones. Created by Alfie Bradley, the Knife Angel, previously exhibited in Liverpool and Hull, was four years in the making and is comprised of 100,000 weapons removed from the streets of the UK. The weapons used in the work range from kitchen knives and flick knives to Samarai swords and martial arts weapons. It is a remarkable work and should achieve the key goal of being a "meaningful concept that could make a difference within the community and throughout the country." 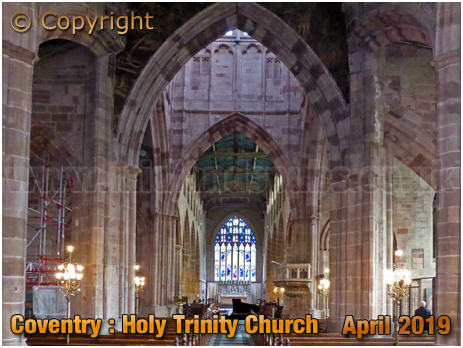 Having previously visited the cathedral, coupled by the fact it looked very crowded inside, we headed to the neighbouring Holy Trinity Church, a structure with a history dating back to the 12th century. The old church was destroyed by a fire in 1257 but its successor somehow survived the blitz of the Second World War. It has many beautiful features and our visit was enhanced by two students playing violin and piano throughout. Their performance was first-rate. 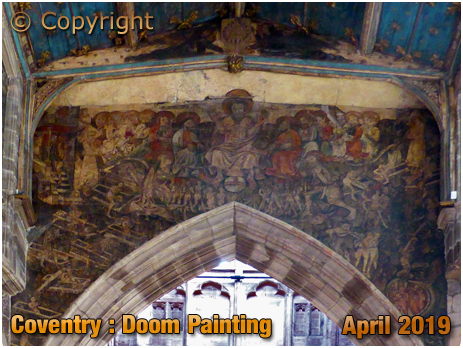 The Misericords, Skidmore Light Fittings and Stained Glass are all superb but the most remarkable feature of Holy Trinity is the Doom Painting, thought to be the best surviving example in the UK. Long forgotten, the Doom Painting was rediscovered in May 1831. Art Historian Andrew Graham-Dixon stated that the painting is "... one of the most important discoveries ever made in the field of medieval art." Dating from the 1430s, this was once one of many paintings in the church, their role being to illustrate parts of the bible to the illiterate. Christ, along with his disciples, sits in the centre of the painting. Mary is kneeling amidst the dead rising from their graves. Above them is the stair to heaven but not all will make this journey for this is the last judgement and some will enter the fiery mouth of hell. Those awaiting their fate include the city's ale wives who were thought to be corrupt, over-charging customers and watering down the ale! Well, all this looking at things worked up a hunger and we made our way to Falafel Corner, our favourite fast-food joint in Coventry and where service always comes with a smile. With our bellies laden with nosh, we pedalled out towards Bishopsgate Green. 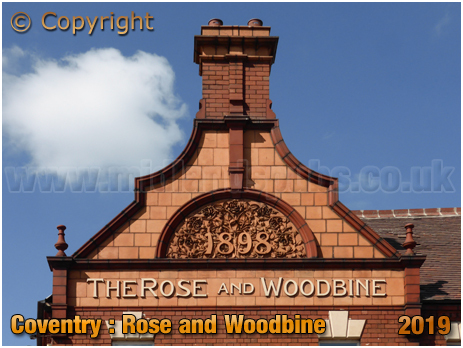 On the corner of Stoney Stanton Road and Harnall Lane stands the former Rose and Woodbine, a building with a rather epic Dutch gable in red brick and terracotta. The gable tells us that the pub was erected in 1898, replacing an older tavern that, judging by maps, was a smaller property. The pub was once operated by Ind Coope and through the merger that created Allied Breweries in 1961, the Rose and Woodbine was later an Ansell's house. In 1981 the company spent some £70,000 renovating the pub but trade fell away in the new millennium and the doors were closed for the final time around 2010. 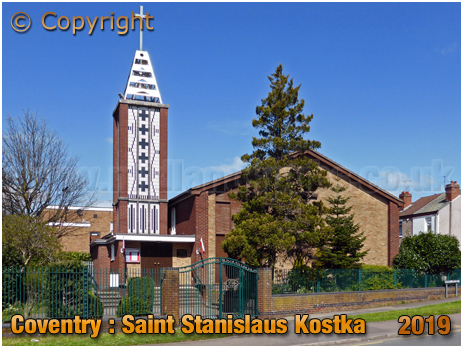 We rolled on through and along Harnall Lane to take a look at Polish Mission Church of Saint Stanislaus Kostka. Sadly, the gates to the car park and grounds were locked so we could only appreciate the building from the road. With many moving from the Wyken Croft Camp in Herefordshire, a significant Polish community settled in Coventry after the Second World War as the reconstruction of the city offered work opportunities. By 1950 up to 1,000 Poles had made a home in Coventry and would attend mass at St. Mary's Church in Raglan Street. It was not until December 1961 that the Polish community could celebrate the opening of this church. Built in seven months by Williams of Cheylesmore, the building cost £16,000, the funds being raised by personal contribution. The Roman Catholic Archbishop of Birmingham, the Most Rev. Francis Grimshaw, led the dedication service after which the parish priest, Rev. C. Sowinski, invited guests to an informal tea in a nearby school. 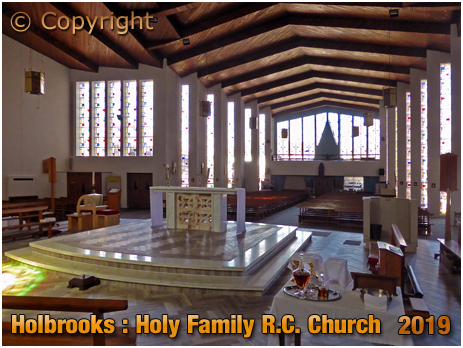 We now headed north to look at the Holy Family Roman Catholic Church at Holbrooks. This building was also closed but Father Pat Brennan, the congenial parish priest kindly unlocked the building for us to appreciate its beauty and peacefulness within. In brief, for those who consider Coventry Cathedral to be magnificent, you will find much in this modern church to value and cherish. Clearly, we are talking about a more modest design but the building's secret is simple .... light, and plenty of it. The stepped floor-to-ceiling glass allows light to flood the interior which, rather like the TARDIS, seems much bigger inside. The wooden ceiling reminded us of Notre-Dame des Neiges at Alpe d'Huez, a church built in the same period. 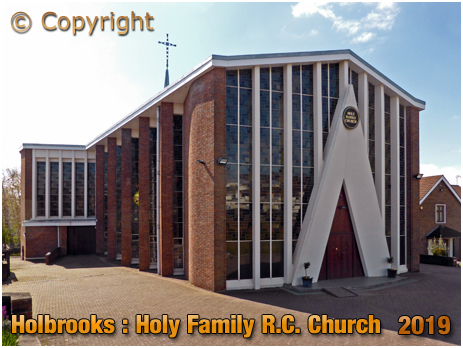 Although the parish was created in 1951 it was not until 1967 that this church at Holbrooks was opened. Another touch of genius was a simple lick of paint. Shortly after Father Aengus Donlon arrived as parish priest in the mid-1980s he initiated some modifications to the interior including the brightening of the drab grey walls. It made me wonder if the aforementioned Notre-Dame des Neiges is missing a trick here. Despite not seeing the original wall colour, I imagine that the difference was strikingly palpable to the congregation. Father Donlon also modified the sanctuary and installed the stained-glass window. This creates a moving colourful circle on the floor and walking across the shining light conjures up images of Indiana Jones in the map room at Tanis! Canon Arthur P. Diamond was responsible for the construction of the church - literally! He took on the role of contractor during the project, thus saving thousands of pounds. He was also responsible for the church hall, school and house. When he first came to the area parishioners would worship in his house. He then constructed a black wooden structure that was dubbed "The Hut" as a temporary church whilst he cracked on with the hall and school. A week before Holy Family Church was due to open the priest slipped a disc when carrying a heavy load, rendering him unable to perform any part in the service. He did however sit among the congregation who had all helped make the project possible. The church was officially opened on July 1st 1967 by Archbishop Hyginus E. Cardinale, Papal Delegate to Great Britain. 1,200 people crammed into the building and 400 more watched the service in the old hut via closed circuit television. Canon Diamond was tragically killed in a road traffic accident on July 31st 1974. The priest, aged 60, was killed instantly in a collision on Bennetts Road South. Eye-witnesses said that his blue Triumph Dolomite skidded into an oncoming articulated lorry while attempting to pass two parked cars near the Bell public house. His body was buried under the Lady altar in the Church that he built. Thanking Father Brennan for his kindness we pedalled a short distance to Lythalls Lane Industrial Estate between Little Heath and Great Heath. So, we went from the aesthetically uplifting to the rather unsightly. Still, this is the 'spiritual' home of Byatt's Brewery. Although this microbrewery was founded in 2011 we have not stumbled across their ales that often. However, whenever we have sampled their beers we have been mightily impressed. 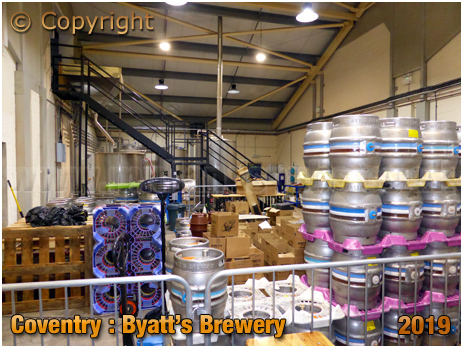 The brewery is owned and run by Coventry-born Lee Byatt and his partner Shelley. The couple have grown the business steadily and in November 2016 moved to these larger premises, opening a brewhouse bar for direct sales and to facilitate brewery tours. 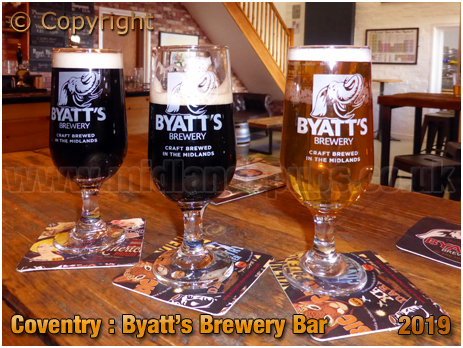 Byatt's have a 12 barrel brew length and brew three times per week. Being as it was Saturday afternoon I imagined that the bar would be quiet and we would have the place to ourselves. Doh, I forgot that Wasps were playing at the Ricoh Stadium and the place was rammed with rugby fans attempting to drink the brewery dry! I kept my cycling helmet on to give me some form of presence at the counter but it still took ages to get served. I can remember drinking Coventry Bitter in the past, along with Urban Red. These beers may still appear from time-to-time but I am not sure. I think they produce six core ales, supplemented by limited edition and seasonal brews. The Regal Blond, a long-standing feature of the brewery's portfolio was on sale and quite excellent it was too. A little down the ABV scale is Vienna Pale but still a great tasting beer. Kick-off was approaching and we had more room for round two. I warily ordered the Cherry Bomb Chocolate Stout, fearing it would be too sweet but, to my delight, the balance of this 5.0% brew was perfection. We had worked our way up to the Gung Ho! which was fantastic, a dark, almost black number that lived up to its overzealous title in terms of balance and flavour. A mighty brew. So, we came to Byatt's with expectations of greatness and they managed to exceed our faith - this brewery produces seriously good beer. So, yet again we had a tremendous day in Coventry. Some people may have scoffed at them being awarded UK City of Culture for 2021 but for us it is a place that keeps on delivering. I am loving the pump clips for the 2019 monthly ales from Fixed Wheel Brewery. Cycling and beer - what's not to like? For April Scott Povey, Fixed Wheel's brewmeister and cycling speed merchant, has unleased a beer just in time to sign on for the peloton of the Giro d'Italia. According to Scott, "the complex flavours of The Sheriff are characterized by the soft sweet taste of the Italian white grape juices. The refreshing notes of melon, lemon and grapefruit on the nose all combine perfectly to create a crescendo of flavours and aromas that fall into a lasting sweet finish." Sounds like a winner of a bunch sprint to me! 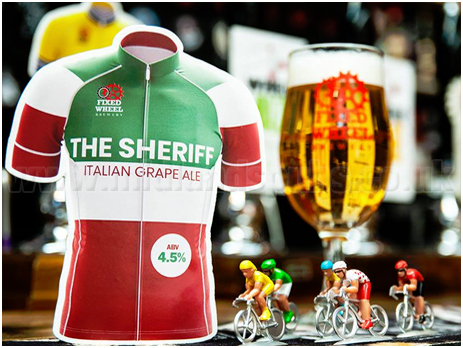 The beer is named in honour of Francesco Moser, winner of the Giro d'Italia in 1984, and dubbed "Lo Sceriffo" or The Sheriff. A tough classics rider, Moser won Paris-Roubaix three times in a row which really is one of the most incredible feats on a bicycle. Moser also won the Giro di Lombardia twice, Milan-San Remo, La Flèche Wallonne and Gent-Wevelgem. He topped his palmarès by winning the World Road Race Championships in 1977. His frame and engine did not really suit the mountains but he took advantage of a relatively flat Giro d'Italia course in 1984 and landed a win on home soil. The triumph of Scott Povey's grape-laced tribute beer is that, following his retirement, Francesco Moser became a viticulturist, cultivating different varieties of grapes on the family-run vineyard located on the hills just north of Trento.